Kevork Djansezian/Getty ImagesThe Mega Millions jackpot is offering its biggest prize ever: $US1.6 billion. A single ticket holder in South Carolina won the $US1.537 billion Mega Millions jackpot, with a cash payout of about $US878 million. They beat extremely slim odds and nearly broke the all-time record jackpot for any lottery – so what should they do with their winnings? They shouldn’t make any decisions in haste. They should keep the news to themselves, hire a team of professionals to help, and not take the cash payout. A single ticket holder in South Carolina won the $US1.537 billion Mega Millions jackpot on Wednesday, nearly breaking the all-time record jackpot for any lottery – the $US1.586 billion jackpot for a 2016 Powerball draw. 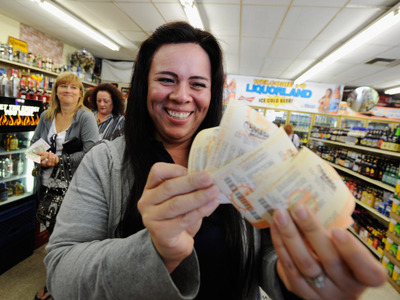 They beat slim odds: Those who bought a Mega Millions lottery ticket had a one in 302,575,350 chance of winning, or a probability of 0.00000033%, Business Insider’s Andy Kiersz reported. The winner of the Mega Millions jackpot has two options – taking a lump sum of $US878 million, or having the full prize paid out in gradual payments of roughly $US53 million a year for 29 years. But before they do anything, these three actions are a must. As excited as you may be to share the big news with everyone, it’s the last thing you should do. “Once you’re announced as the winner, the sharks will start circling,” Kristen Euretig, a financial planner who founded Brooklyn Plans, previously told Business Insider. With only six states allowing anonymity to lottery winners, it can be difficult to keep the news private. But you can do a few things to help make yourself harder to find, like deleting your social-media accounts, leaving town for a few days, and setting up an LLC or trust so people can’t track you. You can also refrain from announcing the big win publicly (like on social media or in a TV appearance) and in person. Your coworkers, great aunt, and former classmates don’t need to know. 2. Get a lawyer and a financial planner. Don’t be one of the lottery winners who blow through all their winnings. First things first, it’s in your best interest to hire a lawyer to help take care of any legal complications that come with winning the lottery. And don’t even begin to think about how you’ll spend your winnings until you hire a financial planner to help you manage your jackpot – they can help with things like knowing your investment options and saving for retirement, as well as deciding what big purchases to make. “It may seem like you have an infinite amount of money to work with, but before you understand the tax implications and options, it’s best to hold tight,” Euretig said. A financial planner can also walk you through one of the most important decisions you’ll make after winning the Mega Millions: whether you should take the money as an annuity or a lump sum. 3. Generally, don’t take the lump sum. Choosing the annuity option distributes the jackpot over 30 payments, which increase by 5% each year to keep up with the cost of living, Lauren Lyons Cole, a certified financial planner,explained in a previous Business Insider article. Choosing the lump sum means taking the entire cash value at once, but it’s less than the value of the total jackpot – the cash payout for Mega Millions is currently $US878 million. While both options yield staggering amounts of money, Lyons Cole advises making the more cautious choice and choosing the annuity. “Taking the annuity offers a degree of protection against blowing all your money in a short time – or being taken advantage of by a wayward financial adviser, family member, or friend,” she wrote. If you’re very good with money and have a team of trusted advisers, a lump sum can offer a greater potential for increasing your wealth if you smartly invest your winnings. And don’t forget: You’ll still have taxes to pay. Any Mega Millions jackpot winner should be smart about their financial decisions and proceed slowly. The money isn’t going anywhere – unless you spend it all. The Mega Millions jackpot is at a record-high $US1.6 billion. Here’s which states spend the most buying lottery tickets.